Brooker's All Day Crockpot Whole Roaster Chicken! 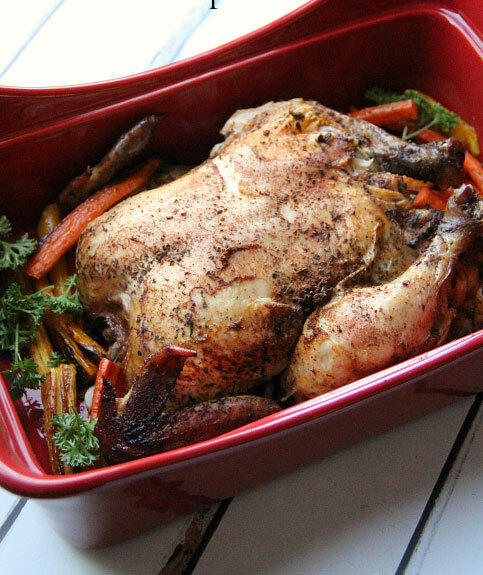 You are going to be shocked at how EASY it is to Roast a Whole Chicken in the Crockpot. The finished product is a moist, rotisserie like chicken. 1. Start by mixing together paprika, all purpose seasoning, garlic powder and salt. 2. Place 4 medium sized foil balls in bottom of crockpot. This will act as a stand to prevent the chicken from drying out. NOTE: You can also use large 2 inch chunks of root vegetables ( potatoes, carrots, onions, turnips) instead of foil for your chicken stand. The when chicken is done, you ALSO have flavorful veggies too! 3. Rub seasoning over your entire chicken (including the inside of the bird). Place on top of foil balls Or Veggies. Cover and cook on HIGH for 4 – 4 1/2 hours, or LOW for 6 1/2 – 8 hours.